The Ring Rail Line connects the Vantaankoski line to the main line at Hiekkaharju via Helsinki-Vantaa Airport. Image courtesy of Finnish Transport Agency. 8km of the total 18km of the Ring rail line passes through a twin-tunnel. Image courtesy of Finnish Transport Agency. Five stations (surface and underground) were constructed as part of the project, while three more stations are also being proposed. Image courtesy of Finnish Transport Agency. 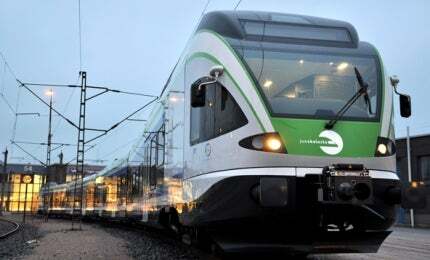 FLIRT SM5 trains run on Helsinki’s new Ring rail line. Image courtesy of Finnish Transport Agency. The Ring Rail Line is a new 18km-long commuter rail line built in Vantaa, Greater Helsinki Metropolitan Area, Finland. The new urban line connects the Vantaankoski line with the main line at Hiekkaharju via Helsinki-Vantaa Airport. Construction of the new commuter rail line began in May 2009 and was completed in July 2015. Excavation of the underground stations using the drill and blast method started in mid-2009, while the underground tunnel beneath the airport was completed in March 2010. The Finnish Transport Agency, the City of Vantaa and Finavia are the joint developers of the Ring Rail Line project. The railway line provides public transportation to approximately 200,000 commuters. The Ring Rail project combines the Martinlaakso line with the Helsinki-Lahti rail line via a short stretch of the Helsinki-Turku line before connecting to the old Helsinki-Hämeenlinna-Tampere rail line. The new line passes through an 8km-long twin tunnel via Ruskeasanta groundwater area and cross the Päijänne tunnel closely. The twin tunnel starts from the north-east side of the Katriinantie-Tikkurilantie intersection and resurfaces in Ilola, to the east of Laaksotie and south of Koivukylänväylä. "The railway line provides public transportation to approximately 200,000 commuters." Three at-surface stations, Vehkala, Kivistö and Leinelä, and two underground stations at Aviapolis and Airport were built under the first stage. Underground stations are also proposed to be built at Ruskeasanta and Viinikkala, and a surface station at Petas. All the stations feature 230m-long platforms. All the surface stations are accessible by covered stairs and lifts, while elevators are provided additionally at Kivistö station. Approximately 14,000 passengers a day are expected to access the new stations in 2025. The project also includes the construction of 38 bridges. Park & Ride facilities for 700 cars and 840 bicycles were created during the initial phase of the project. Passengers from the north have an option to change trains in Tikkurila, while the trip from Tikkurila to the airport takes only eight minutes. The line provides a direct link to the airport for ensuring the passengers to reach the airport from Helsinki city centre within 30 minutes. The line uses new electric FLIRT (fast light innovative regional train) SM5 low-floor trains (train codes: I and P). Supplied by Stadler Bussnang, the trains can carry approximately 2,000 passengers an hour in each direction during peak hours, running at ten-minute intervals in both directions. The FLIRT SM5 train is 75m-long and has seating capacity for 232 people. The passenger and driver compartments of the train are completely air-conditioned. The trains have six doors on each side for fast entry and exit of passengers. The operating speed of the trains is 120km/h. The project was completed at a cost of approximately €750.m ($824m), of which the Finnish Transport Agency contributed €474m ($565m), and the City of Vantaa and Finavia contributed €234.5m ($280m) and €30m ($35m) respectively. The project was also co-financed by the European Union under the Trans-European Transport Network (TEN-T) programme. Pöyry was contracted to conduct general planning and environmental impact assessment for the project. The contractual scope also included detailed design of the access tunnels and rock excavation design for the underground stations. The Boston GLX project primarily involves the extension of the Green Line, the oldest light rail transit in the US. Lemminkäinen Group’s Lemminkäinen Infra Oy was awarded the construction contract for the eastern section of the Ring Rail Line’s tunnel. Lemminkäinen was awarded the interior construction contract for a section of the tunnel and the construction of a station reservation centre in April 2013. The contractual scope included the construction of a 2.6m section of double-tunnel and a tunnel station reservation, in addition to HVAC and electrical works. KONE supplied elevators and escalators, along with ten-year KONE Care® Premium maintenance. PES-Architects were appointed as the architect for the Aviapolis, Airport, Ruskeasanta and Viinikkala underground stations. ISITC Tunnel Construction was contracted for grouting, blasting works, installation of rock bolts, and for complete recording of all the works related to the tunnel. WSP was selected by Finnish Transport Agency for providing planning services for the rail track, stations and bridges for the Ring rail line. The contract also included railway design, geotechnical engineering, structural and bridge design services, along with the design of service roads and intersecting streets. Malux Finland specialises in communication equipment and solutions for harsh environments. The foundations of Malux Finland’s success are based upon an excellent ability to serve customers and find long-lasting and smart solutions. Steelwheel designs and manufactures special rolling stock, wagon moving equipment and shunting equipment for railway infrastructure maintenance. Our 50 years of experience with railway applications provides us with excellent knowledge in this field.